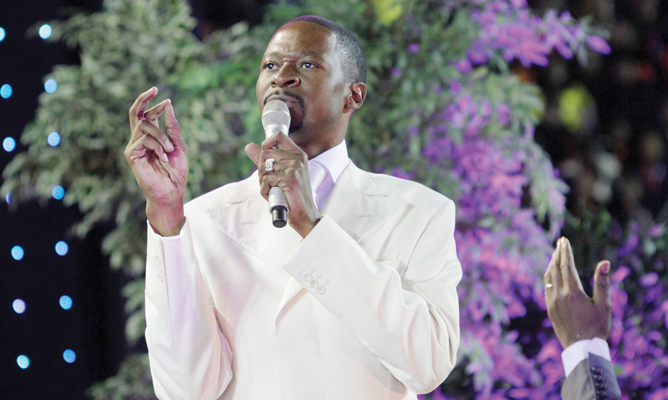 CHARISMATIC preacher, Prophet Emmanuel Makandiwa, who ignited a fierce debate for saying he had done everything to access Heaven, is standing by his utterances. In 30-second video clip that went viral in April this year, the United Family International Church (UFIC) leader said he had secured his place in Heaven. "If you get to Heaven, write this down, and you don't find me there, you would have gone to hell. That's not Heaven because everything that should be done for a man to secure his life in eternity, I have done it, I have done it, I have done it," said Prophet Makandiwa in the video clip. Many critics came out guns blazing, accusing Prophet Makandiwa of blasphemy. They pointed out that the Bible says it is only through Jesus Christ that believers can access Heaven. Some critics quoted Romans 3 verses 23-24 which says, "For all have sinned and fall short of the glory of God, and all are justified freely by his grace through the redemption that came by Christ Jesus." However, exactly a month after the debate, Prophet Makandiwa has broken his silence. The UFIC leader told a Tuesday UFIC partners' service that, "If you want a relationship with God, the requirements are there in the Bible. There is no other Bible to be written again. "This is the will of God, everything that is required by God for you to enter Heaven is available in His word. He went on, "I was telling youths on Sunday (service) that somebody was saying your prophet, he did everything to qualify for Heaven. His argument was that he has done everything necessary to enter Heaven. ''Zvinhu zviri so clear, iwe wangonzi huya, ukandishaya waenda kuhell, hazvidi nharo unongoendako tinongomirira wofa towona. "Why talk about everything when the Bible says you just have to believe in Jesus? I said ask him if believing in Jesus is not everything that is required for Heaven." Prophet Makandiwa insisted that one only needs to believe in their own righteousness to enter Heaven. "What then gives someone the right to go on a crusade calling people to God wausina shuwa kuti wakapedzerana naye here? At what point do you have to convert other people to a place that you are not even sure of iwe wacho? What gives you power to bring out speakers and do a crusade? Going where when you do not know yourself? "Salvation is not a joke, you have to be certain. Believing is everything and once you do that, you have entered Heaven. "God said you are gods, friends not Christians (John 10:34). Christian was a good name but didn't come from a good God. What you name you control; we were named by non-believers and that's why they control us even on the internet. "Another thing that we do in a wrong way is telling people to bring their lives to God. ''We were dead in our sins, we come to him for life; we were desperate, lost and dead, so we should come so that He gives us His life. "Therefore, it's no longer I that live but Him in us. This is what will begin to eat curses in our blood, Kwete kunamata kunege njuga kwekuti unonyora manumbers aunongofungira, woti rega ndinovapa vanoziva vozosanganisa kuti number idzi ndingawinner here, no no."